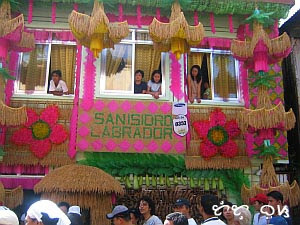 Lucban, a quiant agricultural town in Quezon Province, east of Manila, is famous for the Pahiyas Festival, in honor of San Isidro Labrador, where colorful kiping (rice flour concoction molded from leaves and colored with multiple hues for such perfect photography subjects) decorated houses are featured every year on May 15.
these pictures, taken with Canon Ixus 30 highlights the festival as not only a harvest festival of the townspeople but also showcases art and culture. Kiping making starts by selecting leaves of trees (kabal, coffee or talisay) to serve as molds. Rice is then soaked for two hours before grounding into a paste and mixed with desired food colors and sprinkled with rock salt. The resulting rice paste (galapong) is spread on leaf molds, steamed for about 30 minutes, dried and peeled off. How to Commute to Lucban, Quezon: take buses going to Lucena City and connecting jeepneys to take you to Lucban. 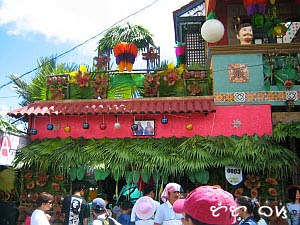 In Laguna, Sta. 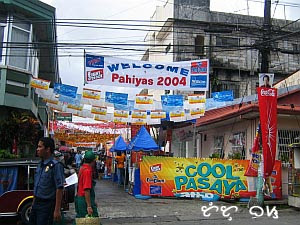 Cruz town or Pagsanjan town plaza, there are large jeeps going to Lucban. 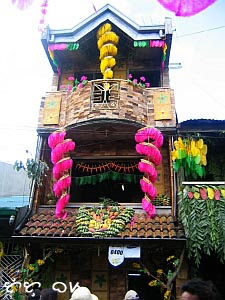 Driving directions to Lucban: from Quezon City it's easier and faster to go there via Rizal route going to Laguna town of Pagsanjan. 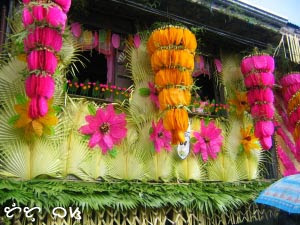 In Pagsanjan, Lucban is about an hour away. You thus avoid the traffic of SLEX and long drive via Lucena.